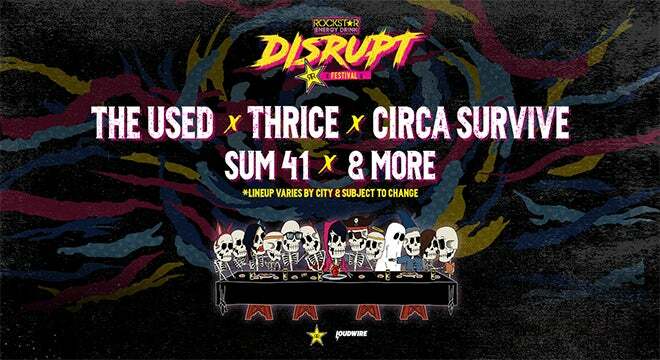 Featuring some of the biggest bands in rock as well as the genre's rising stars, The Rockstar Energy DISRUPT Festival is a brand-new music experience making its debut across North America this summer including a stop at DTE Energy Music Theatre on Wednesday, July 10 at 1:00 p.m. The touring festival will feature a unique line-up, with performances from artists including The Used, Thrice, Circa Survive, Sum 41, Atreyu, Sleeping With Sirens, Four Year Strong, Trophy Eyes, Juliet Simms and Hyro The Hero. Please visit rockstardisrupt.com for full line-up details by city. Citi is the official presale credit card for the tour. As such, Citi cardmembers will have access to purchase presale tickets beginning Tuesday, March 26 at 12 p.m. local time until Thursday, March 28 at 10 p.m. local time through Citi’s Private Pass program. For complete presale details visit www.citiprivatepass.com.